It might have been a washout weatherwise but Britain did at least spend half of August basking in a golden glow. Chris Hoy, Rebecca Adlington, Christine Ohuruogu and another two dozen Olympians flew back from Beijing with gold medals in their clutches, rewards for confounding the sceptics. And we rightly celebrated them. Yet the spotlight was soon switched-off those who came creditable runners-up, such as cycling’s deliciously named Wendy Houvenaghel. Obscurity has beckoned once again. Because that’s what happens, isn’t it? Do you remember the second conqueror of Everest or the chap who followed Yuri Gagarin into space? On 3rd May 1830, an inaugural train rode the undulations between Canterbury and Whitstable on Britain’s first passenger railway. To be fair, it wasn’t the only claimant to that title. With greater confidence, the C&W could boast the world’s first tunnel on a passenger railway, a half-mile hole cut through Tyler Hill. Responsible for the engineering was George Stephenson who went on to raise the capital for a route through the East Midlands, bringing people and coal into Leicester. 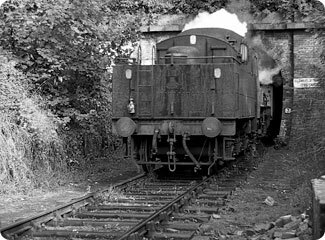 It too involved a tunnel - the second on a passenger railway - but at 1,796 yards, Glenfield really pushed the boundaries, involving techniques which were then virtually untried. Stephenson’s son Robert, himself on the verge of an extraordinary career, rose to the challenge of building it. Kent’s pioneering railway went the way of many others during the 1950s. Tyler Hill Tunnel lay forgotten until the earth above it moved in 1974 - a 30-yard section had collapsed, causing a university building to subside. Much of that passage has since been backfilled. To ensure no similar fate befalls Glenfield, 38 concrete rings have recently taken the strain, the product of a half-million pound project by its owners, Leicester City Council. Local coalmasters were the force behind the Leicester & Swannington Railway; its construction marked a tipping point in their battle with rivals further north who were enjoying the logistical and economic benefits offered by the canalised River Soar. The 16-mile line opened an artery into the county town from a coalfield to its west - a journey which was previously impractical for loads of any volume, thanks to the terrain. 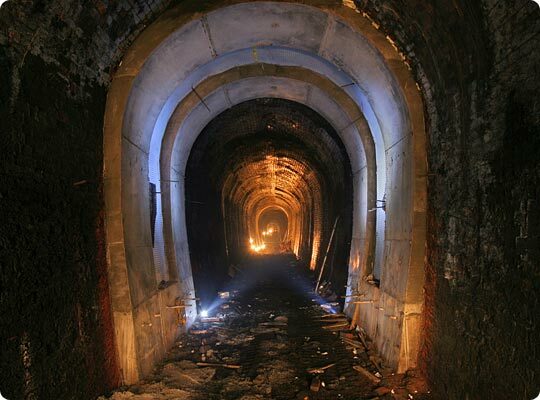 Joining Glenfield Tunnel as the route’s most notable features were a self-acting incline and a second, steeper incline worked by a stationary engine. A trio of contractors lead by Buxton’s Daniel Jowett sealed their deal to excavate the tunnel on 26th November 1830. Much would rely on their experience. But they soon fell behind the ambitious schedule. Trial borings, upon which estimations had been made, pointed to the presence of solid rock and no requirement for a lining. Reality was proving different. Towards the western end, running sands extended for 500 yards. Twenty thousand bricks were despatched to site each week in the vain expectation that 36 yards of tunnel could be completed before the next batch arrived. Three working shafts became four in an effort to catch up. It was down one of these that Daniel Jowett fell to his death. 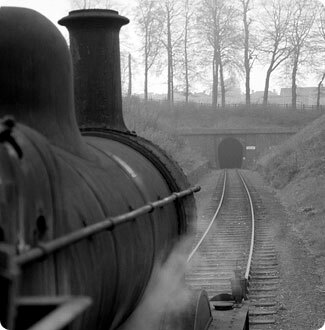 Over budget to the tune of £7,326 - a little over £500,000 in today’s money - the tunnel welcomed its first revenue-earning train in May 1832. It was lacking the “impressive but not too costly” granite portals craved by its owners, presumably because they failed to comply with the latter requirement. It was on 17th July that the first section’s official opening was marked by a special train for the Leicester & Swannington’s directors and 300 guests. Hauling it was ‘Comet’, a locomotive procured from his son’s company by George Stephenson. Though possibly the stuff of legend, it is said that over-packing of the track caused the engine’s funnel to strike the tunnel’s roof, bringing the adventure to a halt and showering soot over those in open wagons. The tunnel proved a draw for the inquisitive, during both construction and operation. High wooden gates kept the public out - these were removed as late as 1929. A favoured dare for young kids was to hide in a refuge while trains passed - a practice which had appalling consequences on one occasion. Glenfield’s tight clearances demanded lower, narrower carriages, with bars over the windows to prevent decapitation. Closure came in 1966 when coal and oil traffic ended. Passenger services had long since hit the buffers. Marconi Radar moved in, taking advantage of the tunnel’s straight mile to test military lasers. But the eastern portal was soon lost beneath infill as its approach cutting made way for housing. One front garden now features a mysterious manhole cover - the only clue as to what lies beneath. In 1969, Leicester City Council discovered a five pound note burning a hole in its pocket. For reasons best known to itself, that cash was invested in Glenfield Tunnel. Its acquisition has left a substantial legacy. With major roads crossing it and several buildings perched directly above, this functionless asset commands ongoing attention from the council’s officers. The shadow of liability is cast over them. towards the tunnel’s now-buried eastern portal. Illustrating Glenfield’s tight clearances, an afternoon train squeezes out of the western end on 9th September 1965. Inspectors venture in to carry out visual exams every five years or so. 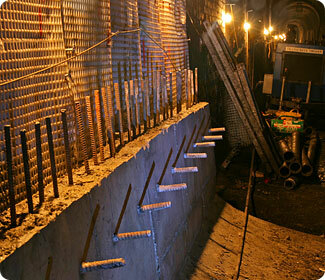 Specialist Haswells - now defunct - was commissioned to take a deeper look at the structure in 2004. Cores confirmed the lining to be mostly four bricks thick, though just three in places. Remarkable variations in profile were recorded - as much as 900mm wall-to-wall whilst the roof rises and falls by over a metre. Distortion became most apparent around the 13 shafts, which had punched into the crown. But these and other brickwork discontinuities did not serve as proof that any movement had taken place - Glenfield’s many quirks and foibles could simply be down to its turbulent construction. 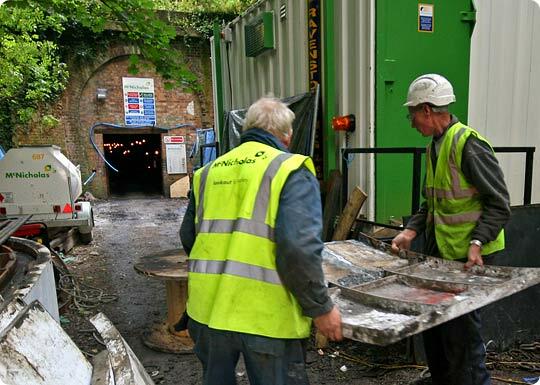 Two years on, Haswells’ recommendation - to install 38 concrete supporting rings - was endorsed by Scott Wilson Tunnelling. It surveyed the bore again and explored the shafts with CCTV, after the council’s City Highways team had cleared them of debris. Like the portal, 12 of the 13 shafts are listed. Above ground, the remaining one exists only as a drainpipe embedded within a boundary wall. 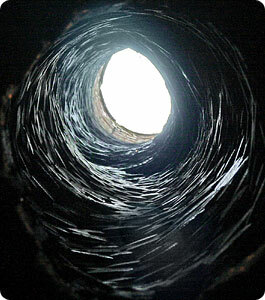 The deepest plunges over 80 feet whilst the narrowest has a diminutive diameter of just 600mm. Quite how this was lined is anybody’s guess. Child labour perhaps? Looking after the surface structures is not devoid of difficulty. Many are in private gardens and, although the council retains responsibility for them, it has no right of access. That said, landowners are generally cooperative. Shaft 8 fell victim to a developer some years ago but has since been reinstated. An excavator damaged another during landscaping works, rendering it unstable; that one was dismantled and still awaits a rebuild. The tunnel burrows beneath the boundary of Leicester City and Blaby District councils. Both granted listed building consent although Leicester’s had to be obtained from the Secretary of State, the council being unable to grant consent to itself. With the structure’s condition recorded photographically, McNicholas Construction Services landed on site in September 2007 to perform the physical works. Scott Wilson Tunnelling acted as project designers. Hibernating bats forced a six-month break before work started up again in July. One of the cast inverts. Attention was paid to the remaining shafts’ brickwork and all were fitted with new grills. But it was below ground where most of the action was played out. Here, the 38 rings took shape, each between 1 and 5 metres wide. The invert was dug out first, with an ‘egg-box’ cavity drainage membrane fitted to prevent water building up between ring and lining. With such a variable profile, modular shutters had to be fabricated and then adjusted for each section. They evolved into more substantial assemblies as work progressed. Last to be tackled was the middle of the tunnel, where the profile was tightest. It was a process which asked challenging questions of those involved, calling for continued refinement. 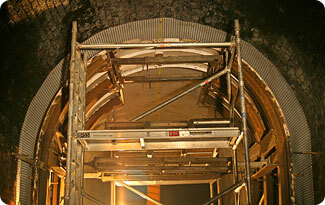 Initially whole rings were being shuttered and cast, using steel-fibre reinforced concrete. By the end, the rings had grown thicker and were being formed in two parts, connected by dowel bars. Work on unique structures is never straightforward - it demands ingenuity, adaptability and resolve. All came to the fore at Glenfield. It’s unlikely that those living on the manicured streets above the tunnel ever lost much sleep about the air-gap far beneath them. Many will be oblivious to its existence. They will however be delighted to learn that their elderly and slightly eccentric neighbour has promised never to cause trouble, having benefited from intensive council care. In the site compound, workmen set about adjusting the modular shutters. This outstanding piece of history, which sharpened the cutting edge of railway engineering, is now locked up again. Sad really that the world won’t see the efforts made to secure its future. A handful of visionaries would like the eastern end to breathe once more and a footpath threaded through it. But with the buried northern portal of Bath’s Devonshire Tunnel soon to see the light of day for the same purpose, not even this would be a first for Glenfield. Forever the bridesmaid, eh?